In this post I will go through various perks that are included in your program fee! Every Friday is Salsa day. You gather on the Amauta terrace, and a local Peruvian Salsa teacher is brought in to take you through Salsa 101 for about one hour. The instructors teaching classes are different every week, and so Salsa 101 is never actually the exact same thing any given week -- which is great because you can attend salsa classes multiple weeks in a row and never feel bored. Almost all of the instructors (if not all of them) are able to set up private or group lessons. With one particularly entertaining instructor, I would have been able score private hour-long Salsa lessons for me and a small group of people for 15 soles per person, which amounts to about... Hold on, let me take out my dumbphone... $5.62 per hour (assuming a 2.67 exchange rate), which is absurdly cheap for dance lessons, or any type of lesson, for that matter. If you want extra salsa lessons for free, almost every major discoteca around La Plaza de Armas offers free salsa lessons from about 9-11pm every night, with salsa practice and then straight up clubbing afterwards, of course. 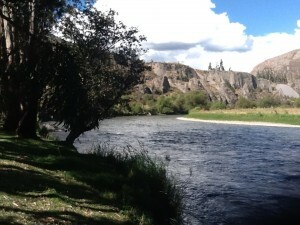 The difficulty usually starts at basic and can ramp up quickly, and if you get there early enough, you and your friends/partner can pretty much get private lessons for a rather long while before everyone else shows up on normal Peruvian time. You can even walk out of the discoteca, and then allow yourself to be "persuaded" to go back inside, about 6 free-drink tickets richer. Careful, though! Free drinks are usually served in glasses washed with tap water, with ice cubes made from frozen tap water, and thus should not be consumed in large quantities, unless you want to contract a nasty gastrointestinal infection. Not recommended. This is pretty self explanatory. Every week, you can sign up (for free, of course) to participate in a cooking class. Honestly, it ends up being you watching the chef cook something really tasty, followed by eating that tasty item, then watching a more culinarily-inclined classmate/Amauta-mate cook said tasty item, followed up with MORE eating. 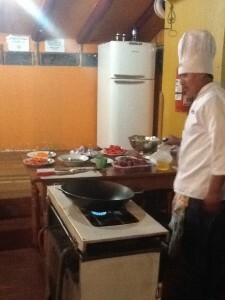 My first week, we watched a chef cook up lomo saltado, which is a very typical and tasty Peruvian stir-fry dish, packed with tender beef and vegetables. 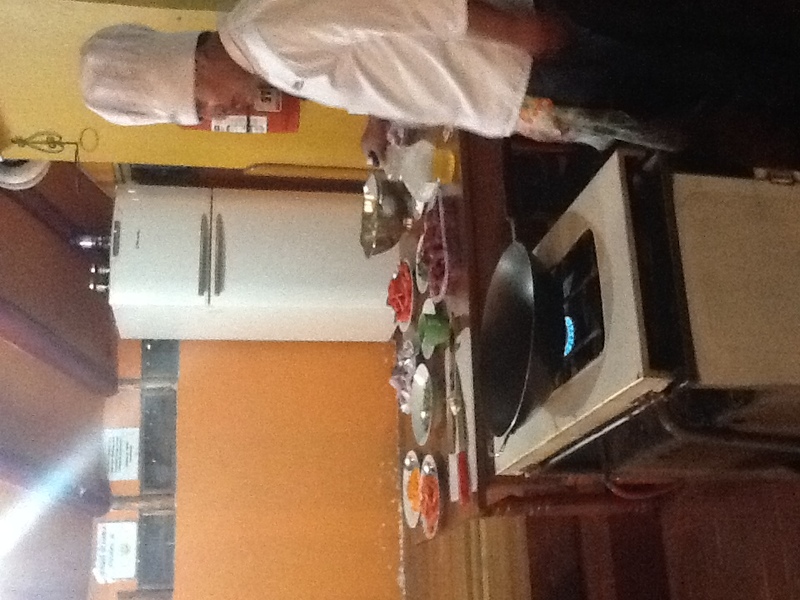 If memory serves me correctly, the chef is actually employed at a rather upscale Plaza de Armas restaurant, so they get some pretty legit people to come in for the cooking classes. I was going to write an entire post about just the Sacred Valley, but didn't want to completely bore anyone, so I decided instead to just keep it as a small(er) part of one blog post dedicated to general perks. 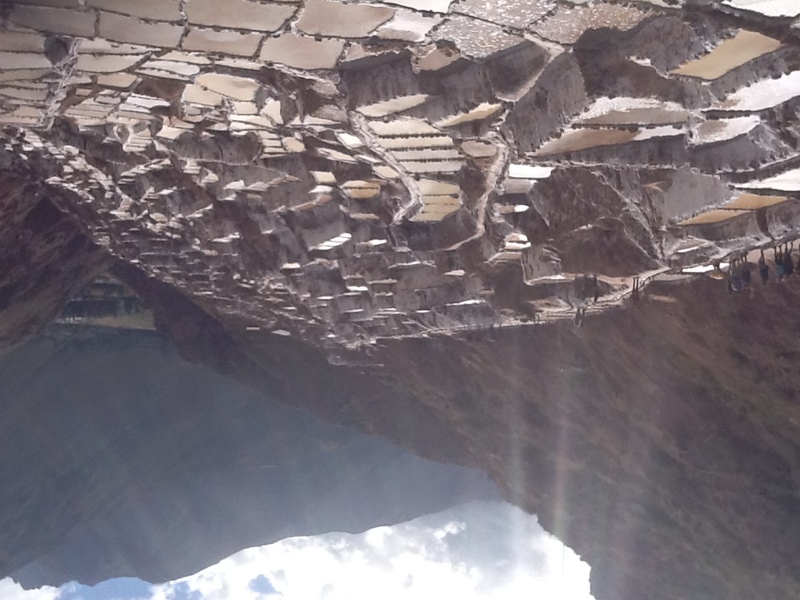 That being said, just know that there is a lot to rave about when it comes to the Sacred Valley stay. 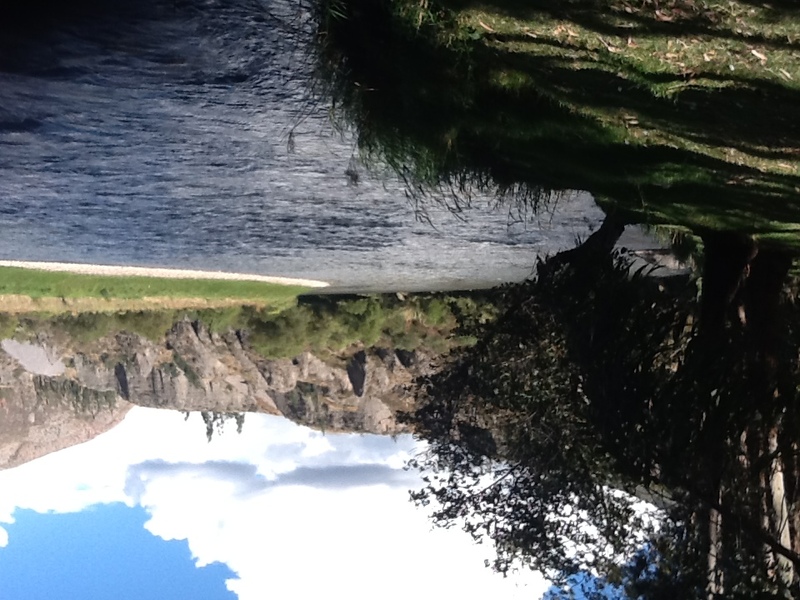 Anyway, a very long story slightly shorter, you have the option to, during your 4 weeks of classes, to travel with a group of other Amauta students (minimum of 6) to the Sacred Valley and take classes there for one full week, free of charge. This includes trips to the Salt Mines (Las Salineras) and the ruins of Ollantaytambo (you pay entry fees, but the potentially-considerable transportation costs are covered), three meals a day (Ursula is an amazing cook -- I simply can't stress this enough), hot water with really darn good pressure, hammocks, and weather nice enough to be able to use the hammocks. It is also ~800m closer to sea level than Cusco, which means the nights are less cold, your skin receives less UV, and the air a lot more oxygen-rich, perfect if you are having a little trouble with Cusco's altitude and want a little breather (no pun intended). 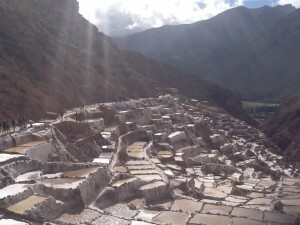 You stay in Yanahuara, which is a little pueblo about a 15 minute combi-ride (local Peruvian super cheap bus) from Urubamba, which is a pretty popular stop included in a lot of Machu Picchu tour packages. Our first afternoon, we met an expatriate German gentleman named Roberto and his Peruvian wife, Victoria, while we were hiking around Yanahuara, and proceeded to have a fantastic thirty minute conversation using a strange mixture of English, Spanish, and German, all while sitting on large rocks at a supremely random intersection and passing around bottles of cold Peruvian beer, courtesy of Roberto. Pretty representative sample of how friendly everyone is. 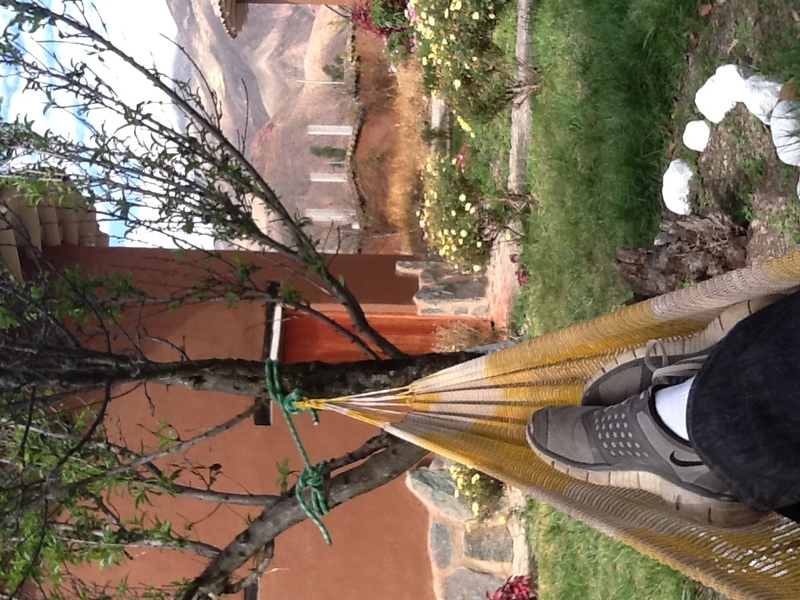 For me, Yanahuara has been (I say 'has been' because I am typing this blog as I sit inside my cute little log cabin-ey room that I share with one other roommate) the absolute cheapest and most relaxing week in Perú. All three meals are covered, which means you pretty much only spend money buying drinks, snacks, and s'mores ingredients for the bonfires you have on select nights. You still have the same amount of time spent in class, and you have the exact same quality of teaching, since your teachers for the week travel from Amauta-Cusco to Amauta-Yanahuara as well. (A) sneaking over to Casa Andina, an absurdly expensive tourist resort with an equally absurdly far-reaching open Wi-Fi network. If you don't have a Wi-Fi compatible device, there is also a cheap Internet café really close to the school. 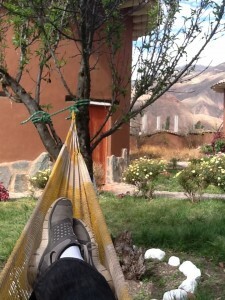 (C) taking naps you don't need (you sleep quite well in Yanahuara) in hammocks. (D) watching classic movies (think: Mean Girls) in Spanish. (E) feeling like a real local whilst buying delicious fruits you have never seen before in your life in the largest indoors farmers market you have ever seen in your life. (F) finding and frequenting a brand-new, quaint little café, T'Tanta Wasi, that is owned by an awesome Singaporean family which sells delicious and cheap edibles, including cupcakes (banana, strawberry, and chocolate), pizzas (personal sizes for 2 soles!! ), and shepherd's pie (an Irish classic in Perú? Delish). Also a great place to steal Casa Andina's internet, even though it's almost 150 meters away. Honestly, the most frustration I've encountered here has come from either the really difficult choice between curry bread or a personal pizza at T'Tanta Wasi, having to decide if I want seconds during meals (Man, I miss Ursula already), or having to wait for a hammock to free up. More #firstworldproblems. Sorry for the super long post! Will blog about the Spanish classes specifically next time. Stay tuned!